Western blot analysis of GAPDH IP samples. IP was performed on Jurkat cell lysates using 10 μg (lanes 1 & 7), 5 μg (lanes 2 & 8), 1 μg (lanes 3 & 9) Mouse anti GAPDH antibody (MCA4739), and 10 μg Mouse IgG1 Negative Control (lanes 4 & 10) (MCA1209). 8.75 μl of each IP was loaded onto an AnykD™ Criterion™ TGX Stain-Free™ gel. 8.75 µl Jurkat whole cell lysate (WCL) was run in lanes 5 & 11 while Precision Plus Protein™ Prestained Standards were run in lane 6. 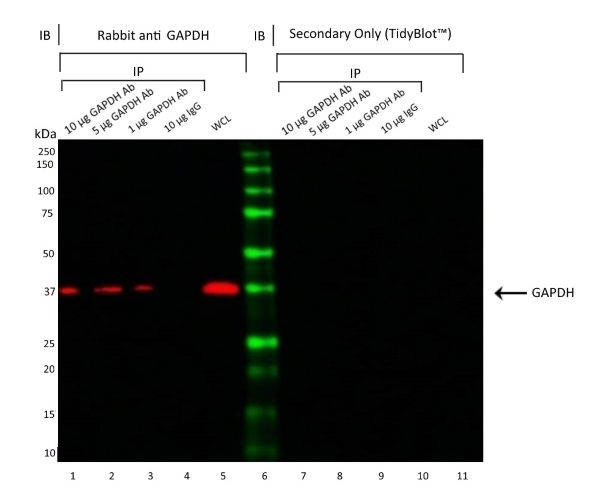 Rabbit anti GAPDH antibody (VPA00187) was used at 1/1000 in lanes 1-5. HRP conjugated Tidyblot (STAR209P) was used at 1/200 and visualized on the Bio-Rad Chemidoc™ Touch Imaging System. Arrow points to GAPDH (molecular weight 37 kDa). HeLa (lane 2) cell lysate was run under reducing conditions on SDS PAGE using the Bio-Rad V3 system and transferred to a PVDF membrane. Bio-Rad Precision Plus molecular weight marker was run in lane 1. 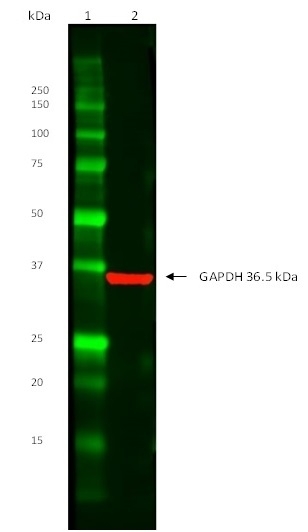 Rabbit anti Human GAPDH (AHP1628) was used as the primary antibody at a dilution of 1/1000 in lane 2. TidyBlot was used at 1/200 as the secondary detection reagent. Visualization was carried out using the Bio-Rad ChemiDoc with automatic exposure. Mouse thymus lysate (25 μg) was loaded onto a 4–15% Criterion™ TGX Stain-Free™ Protein Gel (lanes 2, 3, 5, and 6) and proteins were transferred onto a nitrocellulose membrane. Bio-Rad Precision Plus Protein™ Prestained Standards were run in lanes 1 and 4. Mouse anti actin gamma (VMA00049) was used to detect actin gamma (approximate MW of 46 kDa) in lanes 2 and 5 only. Lanes 3 and 6 were used as controls to detect the background signaling of the secondary detection reagent (no primary antibody control). 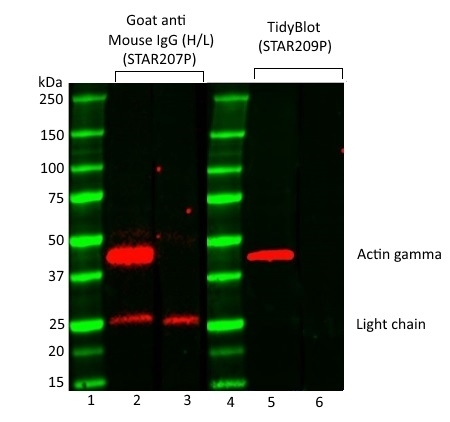 HRP-conjugated goat anti mouse IgG (heavy and light chain) secondary antibody (STAR207P) was used at 1/10,000 in lanes 2 and 3. TidyBlot Western Blot Detection Reagent:HRP (STAR209P) was used as the secondary reagent at 1/200 in lanes 5 and 6. The blot was visualized with the ChemiDoc™ MP Imaging System. TidyBlot Western Blot detection reagent:HRP exclusively binds to native non-denatured antibodies and does not recognize IgGs present in your immunoprecipitate or lysate. 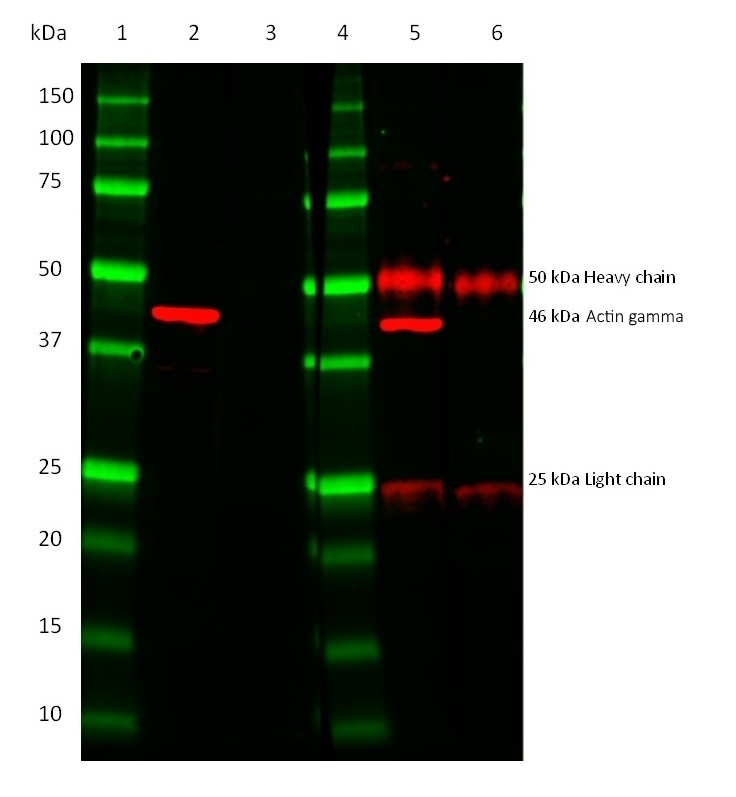 By using TidyBlot you can therefore avoid background from IgG heavy and light chains. TidyBlot Western Blot Detection Reagent:HRP specifically binds to native (non-reduced) antibodies. In contrast to conventional secondary antibodies, TidyBlot therefore enables the detection of immunoblotted target protein bands without interference from denatured IgG. Sources of denatured IgG include endogenous IgGs present in cell/tissue lysate and primary antibodies released from beads during immunoprecipitation experiments. The latter are particularly obstructive when detecting of (co-)immunoprecipitated proteins as IgG heavy (~50 kDa) and light chains (~25 kDa) may mask the protein(s) of interest. N.B. Reactivity of TidyBlot Western Blot Detection Reagent:HRP to mouse IgG1 can be variable. Bio-Rad recommend customers assess compatibility with their IgG1 antibodies via dot blot assay. 1 TidyBlot Western Blot Detection Reagent:HRP preferentially binds to the native antibody used during the Western Blot procedure rather than the SDS-denatured/reduced form present in lysates/immunoprecititates. Best results are therefore achieved by denaturing the immunoprecipitate/lysate fully (consider the duration of boiling the sample to reduce IgG disulphide bonds and the type/concentration of reducing agent). Note: If using mouse IgG1, perform a dot blot to determine compatibilty. TidyBlot Western Blot Detection Reagent:HRP might not detect mouse IgG1. When using a 1/200 dilution (25 μl in 5 ml milk protein), TidyBlot Western Blot Detection Reagent:HRP is sufficient to perform approximately 20 (STAR209P) or 40 (STAR209PA) mini Western Blots. Webinar: Immunoprecipitation (IP) - Complex or not?